Founded 2004 in the secluded town of Arvika, Sweden, ENFORCER have established themselves as the leaders of the new generation metal bands: devoted to the roots of real metal in any conceivable way, weather its spirit, sound or authenticity. After unleashing their debut »Into The Night« (2008), a sophomore attempt »Diamonds« (2009) and their relentless and energy-driven touring onslaughts, ENFORCER found their destined path with the 2013 album »Death By Fire«. 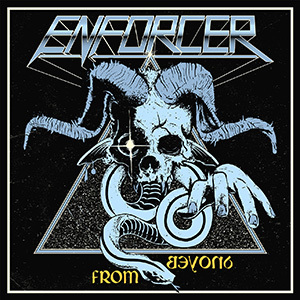 2015 sees the release of the fourth ENFORCER record, entitled »From Beyond«. “The intention of the song writing of »From Beyond« was to continue the path we started with »Death By Fire«. To exaggerate our own sound and to write direct and uncompromising metal songs. In opposite to most of the other new bands, we don't decide to play a certain type of music and therefore limit ourselves in the song writing. We do whatever we want and feel totally free in composing songs,“ commented ENFORCER vocalist & guitarist Olof Wikstrand. Inspired by eastern European metal bands from the late 80s and early 90s, such as CREDO, MAGNIT, POKOLGEP and KAT, the song material for »From Beyond« was collected and worked on in March 2014, right after the band returned from their European headlining tour. With writing and composing being a constant progress for ENFORCER, the new songs were done quickly. 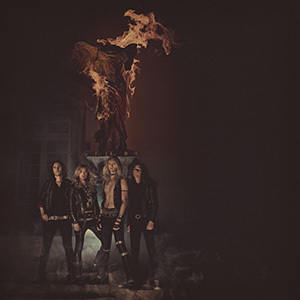 Compared to its predecessor »Death By Fire«, there is no clear red line in the lyrics of »From Beyond«, but still the album has a much darker and something of an anti-existential atmosphere to it. Sound-wise the band focused on a more melancholic way of exaggeration. “In the beginning of our carrier the lyrics were more concentrated on teenage fantasies about living wild and screwing girls and similar things. But the older you get and the more you experience of all these fantasies you had as a kid, the more you realize how earthly it is,” Olof explains. With this sophisticated creative approach, ENFORCER still emphasize the vibe and atmosphere of their music and with the more serious and melancholic path they have chosen, the lyrics evolved accordingly. Altogether, for the band this just a natural development, showing they are still inspired and developing into new realms. It is also a way of not repeating oneself album after album. Just as on »Death By Fire«, all of the production, recording, mixing and mastering of »From Beyond« was handled by Olof and Jonas Wikstrand. This way, the band makes sure they will get exactly the type of sound and production that is needed for an ENFORCER album. 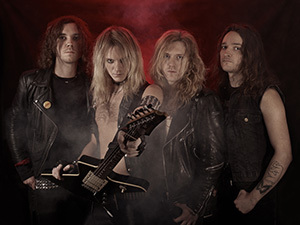 Again, the Swedes spent ten days in Leon Music Studios with Rikard Löfgren for the vocal production, and after the tour with labelmates OVERKILL, the Wikstrand-brothers returned to the studio to finalize the sound. Every sound wave you hear on »From Beyond« is 100% ENFORCER.